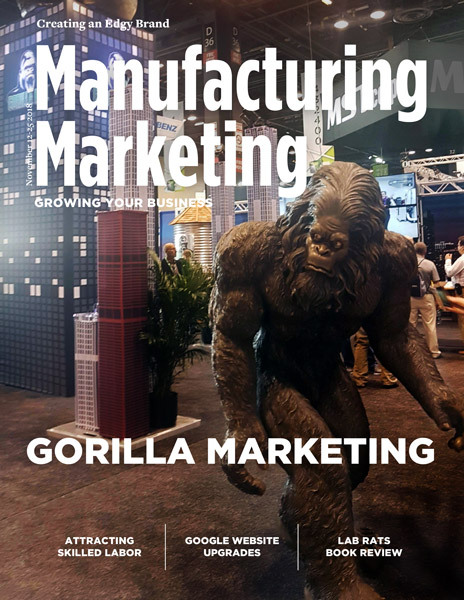 The gorilla is a natural ice-breaker and brings people into the booth to talk – with many people taking selfies with it. 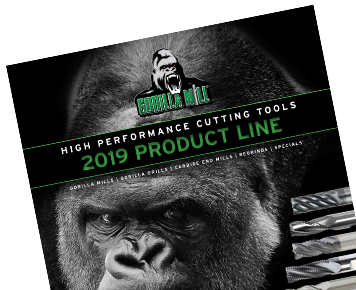 Founded in 1974 by Philipp Laubenstein in his garage, the Carbide Grinding Company, Inc. (dba Gorilla Mill) manufactures high performance drills, end mills and cutting tools. Due to continued growth, Laubenstein moved the company to its current Waukesha, WI facility in 1980. Today the company remains a family-owned and operated business. Laubenstein’s son-in-law, Kevin Cranker is CEO; Cranker’s son Nathan is the co-Operations manager. According to Cranker, the team isn’t afraid to make fun of themselves in order to make their marketing stand out. The product names, for example, play up on the gorilla / primate theme, with names such as Chimps, Silverback, and Baboon. To add fun and a bit of spice, the company uses bananas as a rating scale for their tools in its catalog. Bananas played a prominent role at the 2015 Eastec tradeshow – with the peeled fruit holding the company’s carbide end mills. In an aisle that featured booth after booth of drills and cutting tools laid out in flat, boring arrangements on tabletops, the banana skins were eye-catching and memorable – and yes, a little cheeky, too. HAVE FUN – Cranker advises carrying your branding elements all the way through your marketing mix, from the website and product catalog to the trade show booth and branded schwag. “Don’t be afraid to poke fun at yourself,” he says.